Next → Next post: Desire lines: signs of bad design? yes, why indeed. How many billions are being spent on the project and yet presumably, NO ONE thought to change the station name NOW, well ahead of there being another North Melbourne station. Engineering is always the priority, not thinking of the hapless traveller. I predict that commuter’s myki statements in a few years time will read “Touch on: North Melbourne / Touch off: North Melbourne / Charge $4.30”. With the frequent changes in Singapore, they often just stick the new amendments onto existing maps, but I guess people are less likely to try peel them off over there. They’re quite hard to come off though and I’ve seen a few attempts, some successful, many not. But I agree, better to make the changes sooner rather than later. Hopefully they forget about the idea and just call the new station ‘Arden’ – just like how the Bracks Government forgot about the ‘Eureka Line’ brainfart they came up with in the early 2000s. I’m currently revising my diagrammatic history of Melbourne’s railways and not wanting to print the new map and have the change happen the week after publication, enquired with PTV. The upshot was that there are no plans to change the name in the near future. Coincidentally, I discovered that Kooyong was originally called North Malvern, and this name was changed soon after opening because of confusion with North Melbourne – in fact the name change was flagged prior to opening. So a revision to an existing feature of the map as well as all the extensions and new stations since 2004. I was just changing trains at West Melbourne as I read this! Totally agree an opportunity was missed. Are there other stations that have a locality name that doesn’t reflect it’s true location? Cobblebank – what is it with geographic names now? Are there any concrete plans for the extra stations on the suburban part of the Geelong line, or does that need quadruplication and/or electrification? I expect that the proposed change was announced without proper consultation, believing that it was just a matter of changing signage. Considering the amount of engineering artefacts that relate to the region (Impacting MTM, V/Line, ARTC) once the bill was tabulated, everyone would have agreed to quietly bury the change at some future date to avoid embarrassment. The current North Melbourne is actually in West Melbourne and the new station will be in North Melbourne. Currently the only stations in North Melbourne are Macaulay and Flemington Bridge. The new station is not proposed to have any entrance to Arden St (this is not the case with any other street related station name in Victoria, I believe), it is in the Arden-Macaulay precinct however but the station likely has effective renaming power over the local area and was thus where they could have chosen a new name and still have it reflected by the local area. West Melbourne is also a new that better advertises possible future connection to Docklands, which would make PT between the western suburbs and Docklands more competitive. @Lap has a point. Stations have been renamed before. But would this be the first where the name of a station has been taken over by a completely different station? @Steve – I believe Cobblebank is the geographic name (ie the official name of the new suburb). The working title for the station had been ‘Toolern’. Arden would be kind of a theme with Seddon. They’d need to alter the spelling, very slightly. 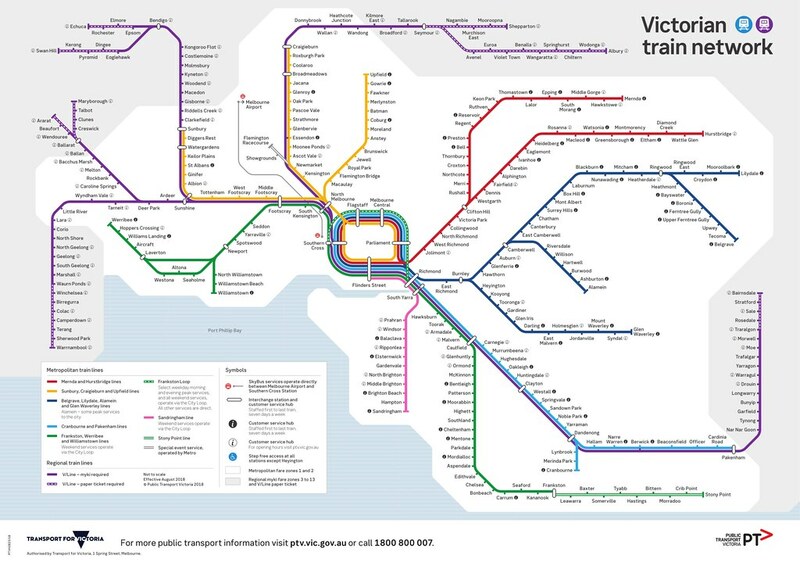 I’ve seen this updated map onboard trains recently and noticed that it includes the PTV logo in the corner again unlike the previous version and other recent signage which excludes it.